iQuake ® is the ideal solution when you want a compact speaker that delivers music in true hi-fi quality. This latest generation of the iQuake system now comes with advanced Bluetooth audio streaming capabilities. In addition to Bluetooth, iQuake ® has a built-in iPod ® dock and two additional inputs(RCA/MiniJack). A built-in 200 watt RMS amplifier gives iQuake ® dynamic properties usually associated with large separate amplifiers. iQuake ® can easily replace a traditional stereo system. "Seriously, I have heard larger, more expensive bookshelf speakers that didn't sound this good"
The new 4.0 Bluetooth standard is a giant leap forward in terms of sound quality compared to older generations - still our engineers found room for improvement! We are very proud to present this unique 4.X speaker. Vast knowledge gained from our long experience with signal transceivers and audio amplification made this significant upgrade within the parameters of the 4.0 protocol possible. Retaining 100 percent compatibility with standard 4.0 and all previous versions all while outputting better audio than any other device tested. The docking station transmits the signal from your iPod ® digitally and then convert the signal to an analog audio signal. This ensures that you always get the best out of the music you put on your iPod. The use of silkdome tweeter driver with neodymium magnet and bass driver with woven carbon fiber cone and pole-ventilated magnet contributes to the unique sound quality that reviewers around the world rave about. The cabinets are made of solid HDF (high density fiberboard) with a thickness of 2.5 cm. The cabinet finish is a process in several stages, beginning with thorough sanding and priming of the cabinet surface. This is followed by seven layers of lacquer finished off with a with a smooth and deep clearcoat. The cabinet is carefully polished and possesses a smooth and soft finish, which sets the standard for elegance. iQuake ® will add sculptural finesse and exclusivity to your home. iQuake supplied as matching stereo-sets available in Black, Red, and Ipod Pink. "Earthquake Sound has hit a home run with its iQuake IQ-52." "This iQuake seems to be almost in a category by itself"
"As for features and performance it sits at the top." 200 Watt RMS Class A / B amplifier. Frequency Range: 45 - 20,000 Hz. Magnetically shielded 5 "bass / midrange. USB input for synchronization with PC / MAC. Output for Subwoofer - optimized for use with Earthquake MiniMe. Crossover frequency for subwoofer output: 80 Hz. Available in a deep black,red and iPod pink piano lacquer. Besides the iPod® docking station on top of iQuake® a number of connectivity options on the back ensures compatibility with most audio sources. Phono input allows the connection of computer, CD player, radio tuner, etc. Mini Jack input is ideal for use with any MP3 player, and with the included adapter it also works as a regular phono input. 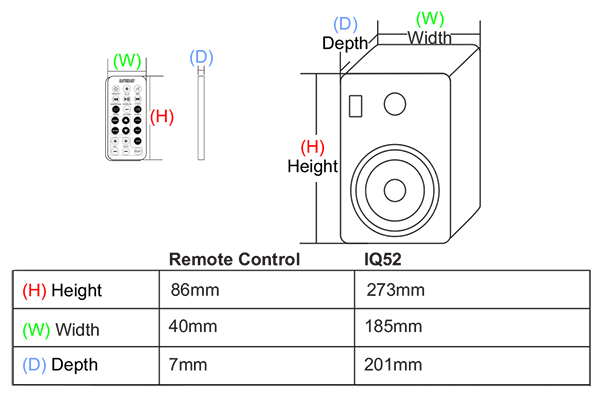 A subwoofer output is also provided so the iQuake ® system can be expanded with a subwoofer. 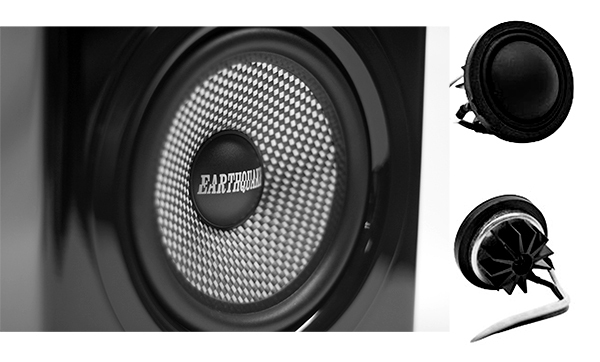 Earthquakes MiniMe subwoofers are ideal partners for iQuake ®. 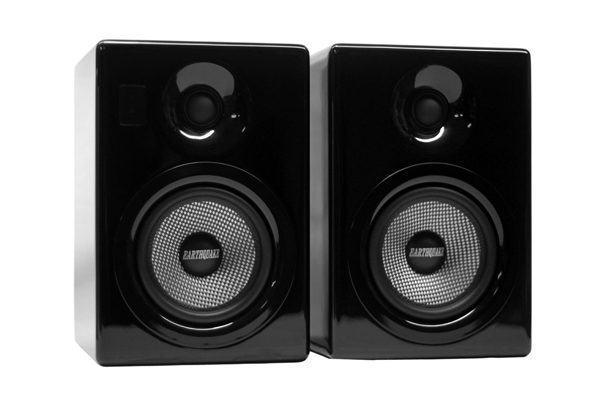 The Sub output is crossed over at 80 hz so it is universally compatible with all subwoofers on the market. the USB connection is used to communicate with your PC or MAC via iTunes so you can update your iPod®. When docked the Ipod is charged by the Iquake system.